The 100 day time limit is up, and the very green-looking “blueprint” is out. This blueprint should set the city alight, in a good way I hope. At the most basic and obvious level, a new greened strip, an entire city block wide, wraps around the south and east sides. Hagley Park, of course, already sits to the west. The Avon River wraps its way lazily round the north side. The new garden city then, sits entirely wrapped by a ring of green. It is a big and bold vision – city planning for a vaunted post-colonial age – and has been brought together by a big united team of architects, planners, engineers, urban designers etc – all headed by Boffa Miskell: landscape architects and planners. It’s nice to see that not everything in Chch is going to be by Warren & Mahoney. An entire city block wide will really reduce the city down to a much smaller size – and the rigidity of the greenscape will set a firm boundary to do things – confine the city to stop it sprawling, and also to set a clear boundary for the suburbanites as well. Judging by the values placed on the houses at the edge of Hagley Park, there is a plus factor to being on the edge. Well, now there is more green to be on the edge of. Ka pai! I don’t know about you, but I find it hard to orient myself in Christchurch. It is just much of the same in all directions – worse than Palmerston North. A bit of something different is really going to help therefore. No longer will the city just fritter away at the barriers. It will stop, and keep those nasty box box retail zones out where they belong in the nowheresville of the suburbs. 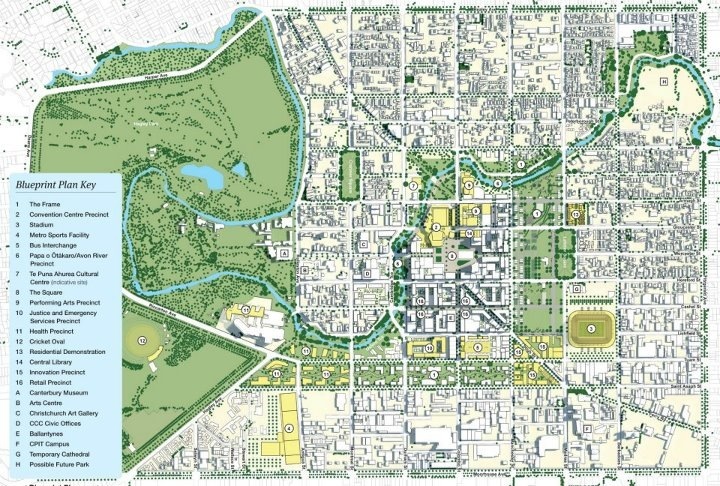 It’s not as radical as Sir Robert Jones scheme to dig out a large lake at the centre of Chch – not a bad idea, but definitely one which took a more sylvan visual of the city as a romantic ruin, islands of ruined stone churches afloat in a sea of blue. They have gone for a sea of green instead. I haven’t had a chance to read the report yet, but one thing I’m going to be looking out for is the proposals for traffic. Will the light rail tracks have been integrated back into the planning? Will they have been extended at all? Or have they been omitted entirely? Has Chch managed to avoid its love/hate relationship with the boy racers? Will the newly reinstated avenues of green merely become stretches of V8 revving tarmac? Of most interest however was the comment from one of the planners. He said that what they were after was the tight city framework that Wellington has, and does so well. That’s a huge compliment to us – and a warning not to get complacent – but a route down which Chch will have a problem following – we have a Harbour to edge our city, and a rim job by a paddock of green will never have quite the same effect. He also mentioned the Laneway word – that is all we hear about lately. The buzzword de jour. Everyone has been to Melbourne. Wellington wants a Laneway down Opera House Lane – despite it being patently obviously the wrong place. Auckland calls its Festival the Laneway just to copy Melbourne some more, despite Auckland not having a single way worthy of being called a Lane. Oamaru has a Laneway that actually is a Laneway. But good old Chch? What will it take to convince them that their biggest problem is the car, and the people that drive them? Delete some of the roads for cars, and automatically you will have some lanes for people. You had encircled, palisaded, surrounded, bordered, defined, perimeter, edging, and circumscribed to choose from and you decided to use the words “rim job”? I’m glad you noticed. Attention to detail is all important. Not much to say about public transport, walking or cycling in the document. Bit of a taboo subject I imagine with road foamers like Brownlee holding the purse strings. Well there is a big bus interchange station, right there at the heart, so something is planned. If only their bloody train station wasn’t so far out of town stuck in the middle of a suburban shopping mall! Denny, I’m not sure that Cantabrians are ever going to want to live in “vibrant, intense inner city living.” They are, after all, a very suburban culture. And very car based too. Do they have buses down there? I guess they do – but when I was down there last, not a bus to be seen (except for the one old Routemaster double-decker). Regarding Napier – I think there is an agreement nowadays that Napier is special, but having lived there, I can say hand on heart that the Napierites thought for many years that they just had the most godawful tawdry post-earthquake architecture, and they were all quite keen to tear it down. Well, all except for one man, and one woman, but that’s another story. It is only in the last 30 years that they have realised that their architecture is special. PS – one thing I think is really cute and very good for the public feedback: the photo you show with the pink / yellow / orange / green post-it notes standing up. Nice touch tying it back to the public submission wall form last year. Well done Christchurch! just attended a forum for the business community tonight (media were excluded). Very mixed feelings. 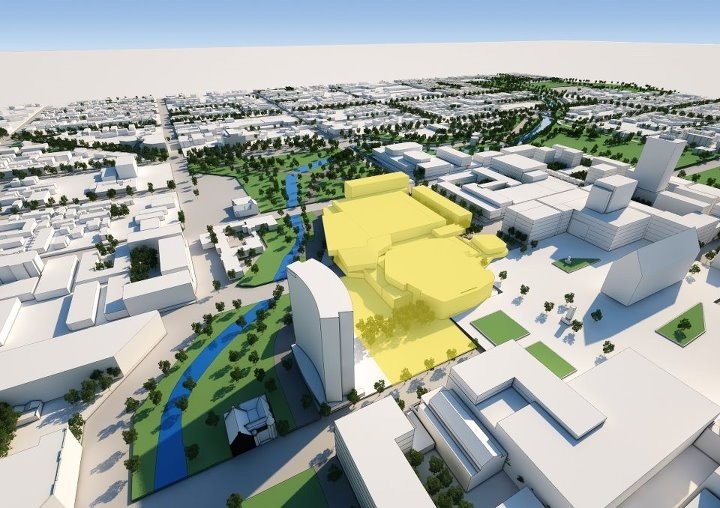 my fears are that the convention centre/performing art centre will kill the civic experience like they do in every city – the plan for the south frame sounds very much like a suburban office park. The east frame – very confusing details regarding occupation/land ownership. Still a lot of details that need to be revealed. Can also say this blueprint has wiped 3 of our most encouraging projects off the map. Very disappointing. Chch had some decent laneway action in the latter years I recall, with a couple of bars, some outdoor seating and an upmarket chippy? In a slightly dodgy area. Are those gone? TPT – i think the simple answer is that yes, they all went in 10 seconds on 22 Feb last year. Since been cleared away – nothing left. Why is this the case? Because these functions take up a lot of space, tend to be monumental, and exclude most people most of the time? For example, MFC sits on one side of Wakefield St and doesn’t engage with people, whereas the other side of the street is shops and cafes and is much more interesting. Good point about the precincts Denny, I have to say the “Justice precinct” gives me a picture of Gotham or Judge Dredd. We’ll have to wait to see how it turns out I guess, maybe these planners are just into comics. The government seemed to have a done a decent job with the plan, much better than some of their other earthquake related work. but it doesn’t have to be – depends on the skill of the architect, and also the remit of the operator of the Convention Centre. Years ago, in Auckland, a group of Architecture students fought very hard against the proposed Aotea Centre. It was bad architecture, outdated architecture, no site relevance, little site consideration, etc etc – the architects told the Council that the proposed scheme should be scrapped, and there was an alternative scheme proposed. Cath Tizard, then Mayor of Auckland, said No, and they built the monstrosity that is the Aotea Centre instead. It does all those bad things that you list David – and minimus. It has absolutely killed the Aotea Square. But it need not have been like that – nor does Christchurch’s proposed convention centre necessarily have to be bad for the civic experience. For instance, anything being designed now would surely tend to fit better into the civic realm, with independent operators and quirky cafes clustering around the base. Guy… So ideally a convention center or performing arts center wouldn’t be a stand alone monumental civic building, but would sort of fit in to the normal fabric of the city? It’d have shops and cafes at street level and you’d enter and go upstairs to the convention or performance space. You wouldn’t sit the building back from the street, and certainly wouldn’t surround it with car parking. You’d avoid making an architectural “look at me” statement, but would just try to be a nice looking building that fitted in with the buildings around it. The problem with both of those venues is that inevitably they’ll want to expand. The convention market is huge and if you don’t have the most square metres you miss out on certain calibre of shows. Every convention centre has the same story. then there is all the servicing, and lack of activity at street level. For the building experience you want to have the huge open pre function space that looks on to the street. Looks great when there’s an event. But for the other 20 hours of every day of the year it is a huge blank empty wall of nothingness. I’ve seen convention centres that promised to do the street level retail thing. Failed miserably. Retail rent ends too high based on promises of high foot traffic, but the daily activity isn’t there to support it. and those are only the ones that I’ve studied. and of course, the finest cinema in Wellington, 2-3 great bars, and a couple more cinemas thrown in for good luck. There is: no parking. No setback from the street. No grandiose swathes of terraces that the Aotea centre has – on which I have never seen a person walk. The architect of the Embassy, Llewelyn Williams, rocks. The architect of the Aotea Centre, Ewan Wainscott, does not. Check out the size of the building compared to the surrounding urban fabric. Make sure to do the whole 360 in street view. Go down the block to the 1100 block. absolutely desolate. also forgot denver – go to 14th and champa – now compare it to the activity on 16th street or down on larimer. the performing arts/convention centre creates a black hole in the city. Hell one of the best convention centre venue is Vancouver – take a look – surrounded on 3 sides by water. my reply being to davidp’s comment, not minimus. Obviously the Embassy is not as big as the Jacob K Javits Centre in New York – which is huge – But my comment still stands. also, check out the moscone centre in san francisco. Again – terrible street presence. check out 705 Pike Street Seattle. The Seattle convention centre is the same size as the proposed chch one. Fantastic work minimus – thank you for that. And thanks to David and Guy as well – couldn’t have said it better myself. 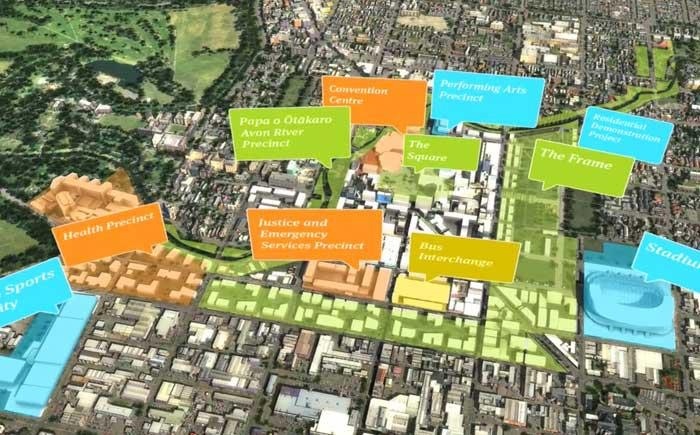 There are obviously some massive issues to be faced and overcome with the ChCh rebuild – this is just one, but a pretty huge one. I’m interested in what they are proposing for the Cathedral Square – they’re not sure if there is going to be a Cathedral there, but they are proposing a Library, and the Convention Centre as well. And Performing Arts nearby as well. All bounded by a – how do we say – palisaded, defined perimeter edging of greenery, and I’m almost starting to wonder if there is any room for office buildings as well within the Avenues. my comments make it all sound like I’m anti convention centres all together – that’s not the case. I just don’t buy it as an urban activator. I think it would make more sense in the zone between the frame and morehouse ave. It suits the existing scale, the servicing is compatible and there isn’t an attempt to create an urban fabric that it’s just not going to be able to perform on. which one is moorhouse? I’m lost I tell you! 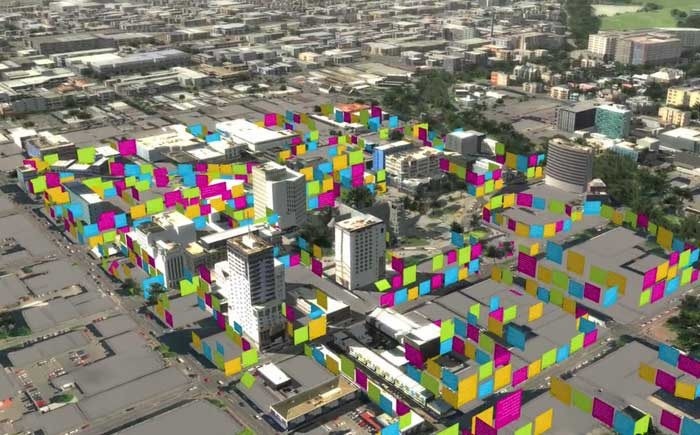 Basically the plan is about replacing a destroyed Victorian city by a 1960s city with a postquake overlay. The idea that urbanity will arise automatically between big lumps of mono-functional monoliths won’t work in CHCH as it didn’t work in Dallas or elsewhere. 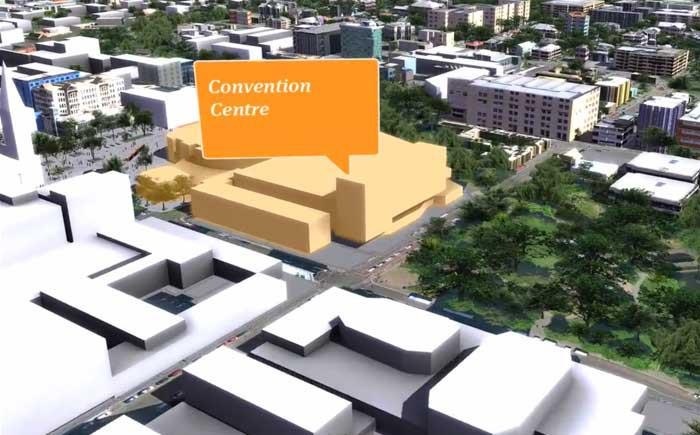 The convention centre should be located on top of a motorway intersection as will add no life to the centre. People will drive there, park their car beneath to be sucked into this commercial entertainment machine with food court & wine bar, It will comprise 50m of contemporary showcase architecture and 500 running meters of backsides. In general master plans are relics from times when life was both stable and predictable. This won’t be the case anymore and planners need to replace eternal grandness by adaption to ever-changing demands. CHCH might still be an opportunity to develop something meaningful in the context of the 21st century. From the Press article today – “His team was made up of six firms. As well as Boffa Miskell, there were the Christchurch architectural practices of Warren and Mahoney and Sheppard and Rout. From Auckland came project manager RCP. Then from Australia arrived urban planners Populous and Woods Bagot. In fact, says Miskell, it was the top people from each of these companies. A group of 10 who if they were not the actual bosses, were principals used to running the show. “We had an ex-professor of urban design from Harvard University. We had the architect from Sydney who’s just spent the last five years on the master- planning of the Olympic villages and legacy project. We had a fellow from the firm that designed the Wembley Stadium, the Olympic Stadium, the Yankee Stadium. yeah, I read that as well. even more worried now than I was before. sydney? nice location near the water with a huge plaza, motorway to the south, large arterial to the west and large scale development to the north. All very pleasant looking, but not an example of urban engagement. Adelaide – pretty much the same. None of those have any of the attributes they’re promising. I’m sure they guy is extremely knowledgeable about the functioning of convention centres. My concern is having someone who knows about urban design. None withstanding that the Nats are just super keen on selling assets – a classic ACT party point of view, despite there being virtually no ACT left; and despite plenty of advice that selling assets stops any future income stream and so therefore long term it’s a dumb idea – despite that, there is going to be a massive hole in the finances, and so money needs to be found. So, what are the assets that CCC will be “persuaded” to sell? What does the city still have that is worth selling? I’m not a specialist on the assets of Christchurch, but at the very least, the council is responsible for roads, sewerage, libraries, fresh water. It’s a little hard to see the roads sold off at a profit, especially given the state they’re in (full of wrinkles), and privatizing the sewer network and the treatment plants doesn’t sound like the sort of thing that big name foreign corporations are going to be aching to put their name to. CCC doesn’t have any / many / much social housing, and what there is there is stuffed anyway. So, my guess, and given the recent discussions over water with the north island iwi, this is going to be tricky; bu tthe obvious target is the water business. My starter for ten: fresh water in Canterbury, on the block and for sale by Christmas. Expect fireworks! After being reasonably impressed by this proposal initially I’m really starting to be concerned now. It’s very 1950s big planning, Le Corbusier would be proud. It’s claiming to be cutting edge and best practice but shows none of the subtle adaptability of the best contemporary planning. 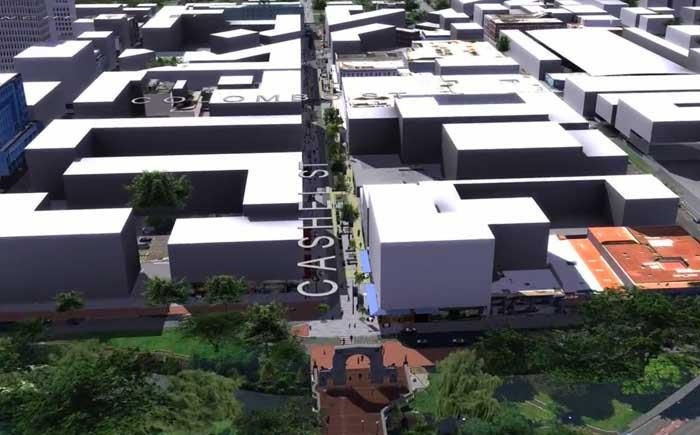 It claims to be a fulfilment of a community’s vision, yet there was no public consultation, and it seems the business community is the only major stakeholder in the development of it. It claims to be bold an innovative but has no novelty at all and sadly the future of downtown Christchurch rests on a convention centre, a stadium. Add to that that unseemly sight of the government nudging the council to sell of their profit making assets to pay for the plans imposed on them under emergency legislation. It’s all very concerning, and I’m an architect, I’m supposed to like the flashy potential! I maybe a small fry, but I actually think the blueprint is a sound document. Reducing the size of the city is the master stroke of this plan. Cutting out 70% of the building stock reduces the problems adhoc redevelopement would place on all resources – money, material, labour, time. Without this approach the economics of reconstruction would not stack up and the city would stagger along slowly for decades to come. 10/10 I say. Sav- thanks for the link to Travelblog. I read another article on that website titled Severance city. (which is now titled Driving History on Architecture now website) I got me thinking about the blueprint and how the frame has effectively severed the CBD for the better. Creating a walled city will increasing perimeter area (= higher value land) on both sides of the green belt. The CBD looking out and the Residents looking in. I do have misgivings about the appropriateness of placing the convention centre in the heart of the Cathedral square – to quote the blue print “The convention centre will become an iconic and internationally recognised civic building. It will be fully integrated into the surroundiing area, providing a range of high quality public spaces and stimulating retail and commercial activity. And when was the last time any of us went to the local CC? Hey, Auckland does too have laneways: Vulcan Lane, Durham Street East, maybe Swanson Street and Fort Lane if you’re feeling generous. What’s Wellington got – Chews Lane and that’s it.